I made these with my daughter for our family Christmas dinner. Her favorite part was adding the food coloring. We got about 20 bars out of the batch so it makes plenty. They are really rich so you don’t want to make the bars huge. 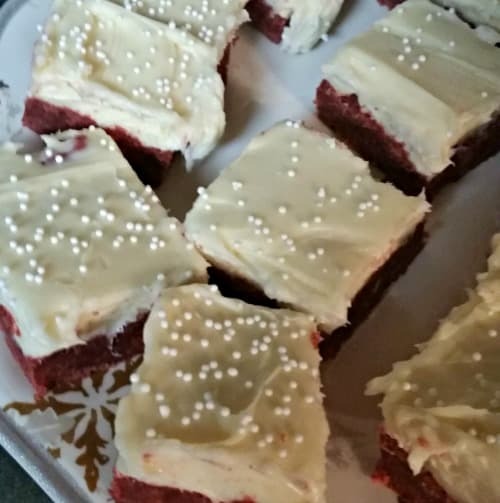 You can use the recipe for the cream cheese frosting below or if you are short on time, you can just use some store bought frosting. You will probably need 2 jars of frosting if you are going to purchase it. 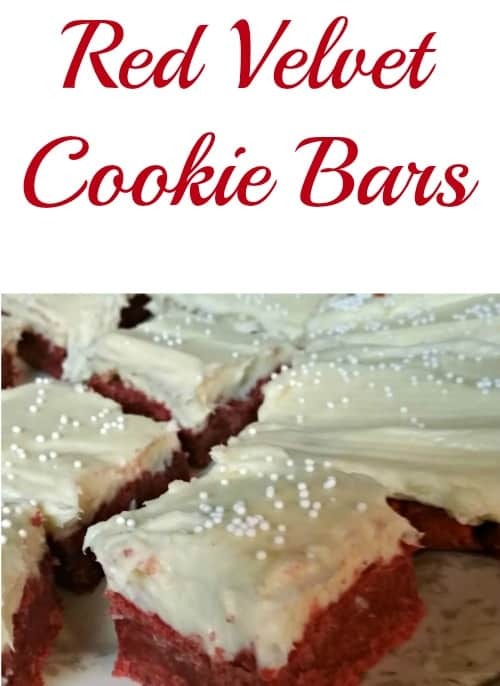 To make clean up super easy, line the 9 x 13 pan that you are going to bake the cookies in with some aluminum foil and then spray the foil with cooking spray to make removing the cookies really simple. There is nothing worse than leaving half the cookie in the pan when you are trying to get it out! Also, when you are spreading the cookies in the pan, I found it easier to just use my fingers to spread it out and press into the pan. Then go over it with a spatula to make the top smooth. In a medium bowl, whisk together flour, cocoa, salt, and baking powder. In a mixing bowl, mix 1 cup butter and sugar until light and creamy. About 2-3 minutes. Then mix in the eggs, vanilla, and food coloring until combined. Add the flour mixture until a soft dough forms. Press dough into the bottom of a 9×13 inch pan. Bake for about 20 minutes until the edges start to pull away from the sides. Insert a toothpick in the center and make sure it comes out clean. To make the cream cheese frosting, beat together the cream cheese and butter. Add the powdered sugar and vanilla. mix together until smooth. Frost the cookies after they have completely cooled.